Studio fully renovated, penthouse with a really very nice veranda, equipped to meet the requirements of demanding travelers to Athens. Following the minimalistic line of design and furnishing is the ideal choice for executives that demand luxury modern enviroment. Fully equipped only the luggage need to bring. Located in the heart of Kolonaki, the excellent choice for those need to relax after work and enjoying a dinner or drink in the square. The ideal place to live for a memorable time in Athens. This furnished apartment is located at the borders of Psychico to Athens -Ampelokipoi and it is on the 3rd floor of a 4 floors private building. The owners that also constructed the building used the best materials and followed a luxurious design to meet their requirements. Extra features of this property are the fantastic marble floors, the modern fully equipped kitchen, air conditioning, satellite, quiet neighborhood, very good quality of tenants in the building. The city view is one of the extra elements. Metro and market are only 10min walking distance away. Apartment in Glyfada in a luxurious, peaceful and secure residence with gym, exercise room, sauna, yoga room, and children's playground, next to the golf course and the commercial center, just a few meters from the sea. On 1st floor, 2 master bedrooms, wc, kitchen, living area with fireplace. The residence extends between two large roads easily accesible by means of transportation. 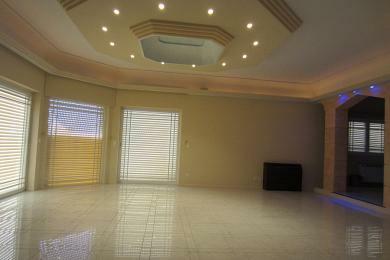 Luxury house in Ekali, in the area of Dikigorika, close to the local market, in stadiums and parks. Divided into 3 levels, offering all modern comforts seeking a family. Entering the house there is a large hall and a living room, another living room with fireplace and a fully equipped kitchen. An internal staircase leads to the first level where there are the 4 master bedrooms with their bathrooms. The attic completes the house and it can be used as an office or as a bedroom as it has its own bathroom. All levels open into large terraces with beautiful views. 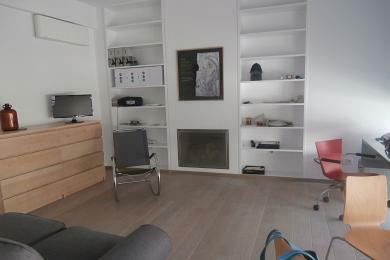 2 parking spaces, storage room, modern are amenities that ensure a comfortable and pleasant living. 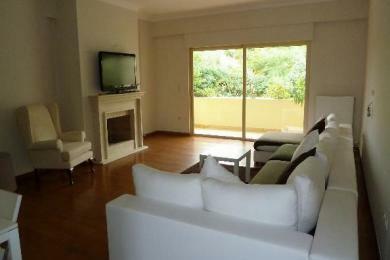 Beautiful maisonette in Exoni, Glyfada. Spread over 2 levels. Downstairs is a living-dining-kitchen room. There is also a wc. Upstairs there are 4 bedrooms and 2 bathrooms. One bedroom is a master with jacuzzi. Heating with natural gas via Convection. There are also 4 aircondition devices. Single house in Glyfada, very near to center. 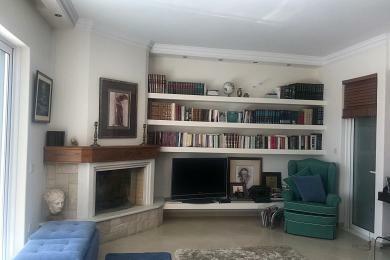 House in Glyfada, very near to the center just a few meters from the sea. 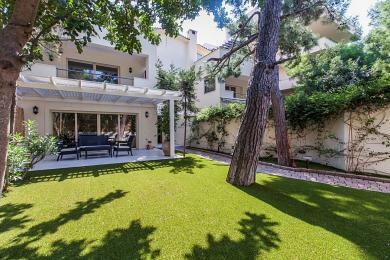 In a peaceful and luxurious setting surrounded by greenery, close to main roads, sea and shopping center of Glyfada. The house is split into four levels with elevator. It has 4 bedrooms with their own bathroom on the first floor, two bedrooms on the 2nd 2 bedrooms with their own bathroom also (attic) ideal for office and playroom or 1 service room in the basement. 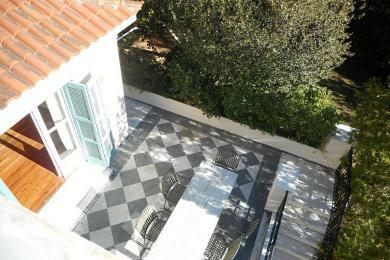 It has a private garden and large terrace and numerous auxiliary spaces. Villa surrounded by a huge garden, with high trees, beautiful flowers, patios the perfect reason to stay out the whole summer!! Builded in early 30's definitely has a strong character as it meant to be the house of a family with high standard lifestyle. A house that families will adore, children can play happy and safe in the garden, meetings with friends that can take place either in the classy interior - high ceilings with fantastic plaster details, pine wood floors- or as the verandas and the garden corners. The guest house will make all your visitors feel independent and enjoy their stay at your home. 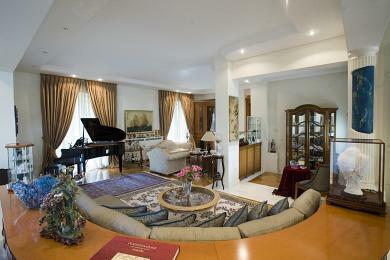 Luxury furnished house in Ekali, in the area of Dikigorika, close to the local market, in stadiums and parks. Divided into 4 levels, offering all modern comforts seeking a family. Entering the house there is a large hall and a living room, another living room with fireplace and a fully equipped kitchen. An internal staircase leads to the first level where there are the 4 master bedrooms with their bathrooms. The attic completes the house and it can be used as an office or as a bedroom as it has its own bathroom. All levels open into large terraces with beautiful views. The basement consists of a living room, a wc, a laundry room and a master bedroom and a separate apartment with its own entrance consisting of a living room, a kitchen, a bedroom and an exit to the garden. 5 parking spaces, storage rooms, modern and stylish furnishings are amenities that ensure a comfortable and pleasant living.